If you’ve been a long-time follower and listener of the podcast, you know that my most viral pin is my How to Clean Up Pinterest Boards pin. It’s been going viral for about two years and accounts for most of my traffic (you can see the pin and download a special guide, in my How to Clean Up Pinterest Boards post). 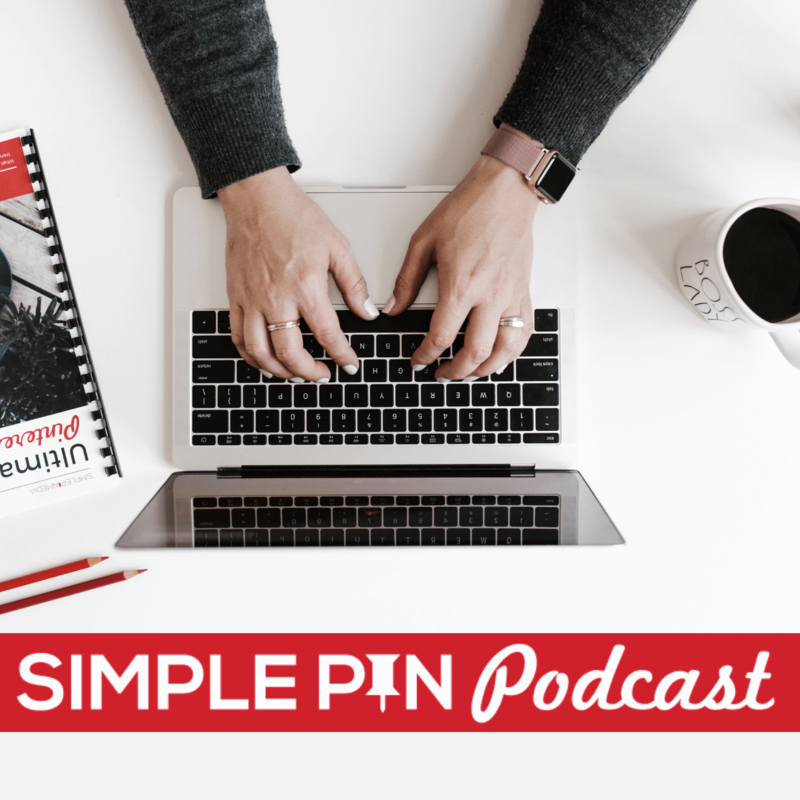 Today I’m talking all about spring cleaning Pinterest boards with Alisa Meredith from Tailwind. I am always getting questions about cleaning up Pinterest boards. In fact, we even offer a clean-up service at Simple Pin. But since some people might not be able to afford to outsource that set of tasks, we decided to share all the steps of our clean up system (which anyone can follow) in today’s post. Click here to watch Alisa and Kate on the Facebook Live video. Often when we open up a Pinterest account, we look to see if the pinner’s profile matches their branding. We’ll open up their site and see if there are connections between the profile and the website. We look at the name, keywords, descriptions, and links. It should contain a lot of keywords. It should clearly convey what you’re all about. Your boards should communicate your message. If people hop onto your profile, would they understand what your brand or business is about? Every account needs to have a board that contains all of your own content. Make sure this board is the first board in your profile. Re-evaluate Keywords – The keywords in board titles will match up with search terms, so make sure your board titles are very specific. If your boards are doing poorly, or if you’re just using them personally, move them to secret. Your followers don’t need to see content that isn’t resonating with them. Deleting Pins – One of the things I mention at the very top of the board cleanup post is that you don’t need to delete pins. The pin limit of an account is 300,000. If you’re close to that number, re-evaluate why you’re pinning so much! We did get a question about business e-commerce accounts that are pinning one-off items. What do you do once the item is sold? My suggestion is always to try redirecting before anything else. Find another product you can offer that is close to the original instead of deleting the pin. Board Sections – Keep in mind that, at the time this podcast is airing, board sections is strictly a user tool at this time and is not factored into the algorithm. If you take the time to section your boards, it’s really only for your personal benefit. I would suggest creating new boards over sectioning because that’s where you can optimize for the smart feed. I tell people to do their board clean-up about once a year. Very few people are going to your profile, so you don’t have to do it that often if you’re regularly evaluating your boards. I only have 35 boards on my profile and I only add more boards when I feel like I need to or there’s a particular topic the community is asking about. The purpose of group boards is collaboration. I want to be a part of group boards that have a great title and that are consistent with my branding. I also always look at my board insights and engagement in Tailwind to see if the board is performing well. If you’re part of a group board that isn’t targeting your audience, leave the board and focus more on your personal boards. Your personal Pinterest boards should never be an afterthought. Group boards will no longer bring more exposure to your content. Your personal Pinterest boards should never be an afterthought. Group boards will no longer bring more exposure to your content. Board order is important because when people come to your profile, they will see the boards at the top that have the most engagement and speak the best about your brand. Group boards should be at the bottom of your profile because you want your own boards at the top and shining the brightest. As far as board covers go, my best advise is to use a beautiful image with no text. The best ROI for your time is NOT spending 4 or 5 hours working on your board covers. It can be a very frustrating endeavor. Only do it if you have time and plan to do it while binge watching Netflix. Google recently released a new update which prioritizes accelerated mobile pages. We saw this coming because everyone uses their phone these days. How does this affect Pinterest? As I tend to do whenever something Google-related comes out, I reached out to Kristie Hill to get her take on it. Her viewpoint is that this is a great thing! Instead of competing against Pinterest pins for ranking in the Google search feed, now your posts have a greater opportunity of being seen. Whenever you see something update on Google or Pinterest, and you see an article on it, keep in mind that the information shared by the author only represents their experience. Test it yourself. Read more than one article so that you are exposed to multiple perspectives and viewpoints. 600 x 900 is the official guideline for image size. At the time this podcast/post is published, images are now cutting off at 1260 on Pinterest. So what do you do about all of those long collages you’ve created? This requires us to think more purposefully about what is in our images. You don’t want it too busy. You always want to use clear, professional-looking photos. There aren’t rules about how many photos you need to use. That’s it! Your Pinterest boards are cleaned up, organized and ready for more beautiful pins. Make sure you download our printable How to Clean up Pinterest Boards Cheat Sheet (at the bottom of this post) to make spring cleaning your boards easy peasy. Make sure to listen to the podcast for tons of other information and thoughts from Alisa and me as there was way too much to share in this post. Hi Kate!! I am in the process of cleaning my boards but cannot figure out whether it is better to take advantage of the “add section” option to my boards. For example, is it better to have 3 separate group boards like, vegetarian appetizers, meaty appetizers and vegan appetizers OR should I create one APPETIZERS group board with 3 separate “Sections” within that general appetizer board? Don’t hop on sections just yet. Make your board name super niche so best appetizers or best savory appetizers. Make separate boards for sure.